Well, that is what it looks like to me. The light was fading when I snapped these photos. Apart from the colour, which was a consequence of the furnace. I'll poke Shiona later. Having seen the odd bit of Kirkhill Glass recently I have some doubts that either of these pieces were made by John Airlie. 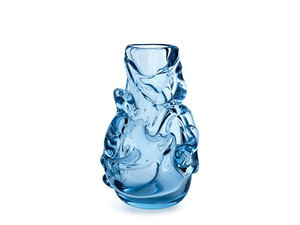 The blue of the lampbase does not seem pale enough to me and I have recently seen another similar clear vase that I think is from the same stable but with much more rounded decoration. Did all of the glass produced at Kirkhill have a blue tint, or at some stage were changes made to the furnace to eliminate the tinting of the glass? Kirkhill Glass was pretty small scale, so I doubt the furnace was changed. I did poke Shiona via Facebook but got no response. Looking at my piece of Kirkhill (I know it's Kirkhill because Shiona gave it to me), your piece looks too blue. My neck glass is a very pale blue, even in the thickest bit (1 in at least) and has the very faintest hint of green. Much more like the pale blue old bottles you see. Thanks Christine, in that case I may well buy that 'similar' vase I mentioned (assuming it has not been sold when I next see the seller), it won't hurt to have another example to help rule things in or out. The other possibility, quite strong I think, is Scandinavian. Aseda (Borne Augustsson) and Magnor did vases like this this, and I seem to remember a lamp in that style also. Possibly Czech too but maybe the colours are a bit muted for that, if not Kirkhill then I would look towards Scandinavia first.